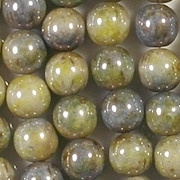 White glass beads with a light green/blue coating and a mottled brownish-topaz coating on top of that. 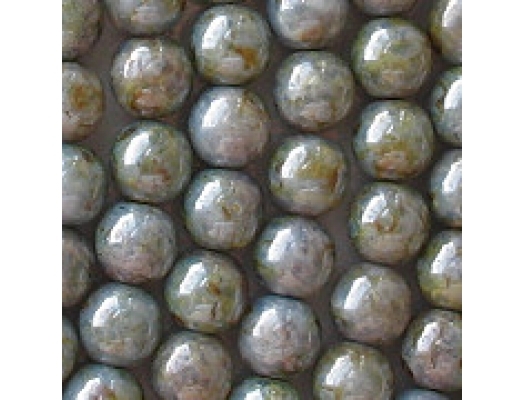 These are luster beads, meaning that the finish is particularly shiny. I don't know if the luster finish is a separate coating, or exactly how they achieve it. 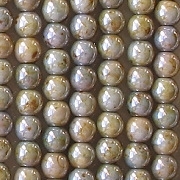 The first batch of these beads had more obvious mottling than subsequent batches. I liked the heavier mottling. I am now getting these beads from two different sources. Supplier E sells a bead which is a little more green than supplier M sells. 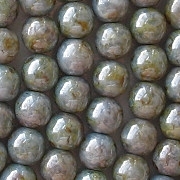 When I compare the beads, they look different to me; but when I photographed the beads from supplier M, the picture looked the same as the picture that was already posted. Consequently, I am not selling the beads separately. 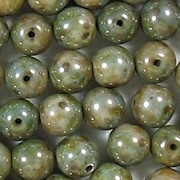 When the slightly more greenish beads from supplier E sell out, I will simply substitute the slightly more bluish beads from supplier M.
Please note that the picture is a close-up. 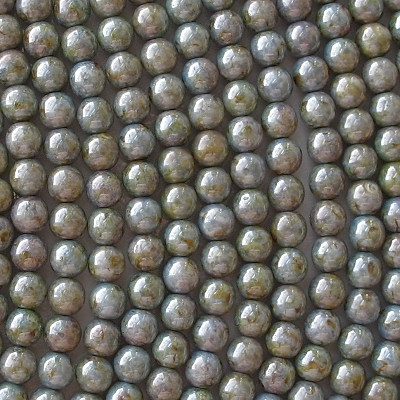 When viewed with the eyes, the colors tend to meld together, making the beads look more homogenous.